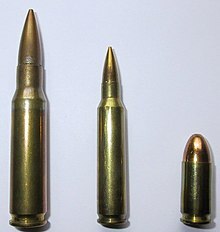 Although not identical, the 7.62×51mm NATO and the commercial .308 Winchester cartridges are similar enough that they can be loaded into rifles chambered for the other round, but the Winchester .308 cartridges are typically loaded to higher pressures than 7.62×51mm NATO cartridges. Even though the Sporting Arms and Ammunition Manufacturers' Institute (SAAMI) does not consider it unsafe to fire the commercial round in weapons chambered for the NATO round, there is significant discussion about compatible chamber and muzzle pressures between the two cartridges based on powder loads and wall thicknesses on the military vs. commercial rounds. While the debate goes both ways, the ATF recommends checking the stamping on the barrel; if unsure, one can consult the maker of the firearm. The 7.62×51mm NATO cartridge approaches the ballistic performance of the original U.S. military .30-06 Springfield M1906 service cartridge. Modern propellants allowed for similar performance from a smaller case with less case capacity, a case that requires less brass and yields a shorter cartridge. This shorter cartridge allows a slight reduction in the size and weight of firearms that chamber it, and better cycling in automatic and semi-automatic rifles. 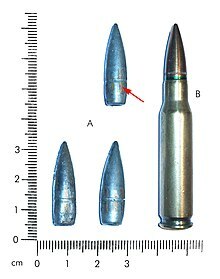 The .30-06 Springfield M1906 round weighed 26.1 grams (403 gr), and the 7.62×51mm NATO M80 round weighs 25.4 grams (392 gr). Example of a ballistic table for a given 7.62×51mm NATO load. Bullet drop and wind drift are shown both in mil and moa. Work that would eventually develop the 7.62×51mm NATO started just after World War I when the large, powerful .30-06 cartridge proved difficult to adapt to semi-automatic rifles. A less powerful cartridge would allow a lighter firing mechanism. At the time the most promising design was the .276 Pedersen. When it was eventually demonstrated that the .30-06 was suitable for semi-automatic rifles, the .276 was dropped. Thus when war appeared to be looming again, only a couple of decades later, the .30-06 was the only round available, and the M1 Garand provided U.S. troops with greater firepower than their bolt action-armed opponents. The Garand performed so well that the U.S. saw little need to replace it during World War II, and the .30-06 served well beyond the Korean War and into the mid-1950s. The .30-06 was officially replaced by the 7.62 NATO M14 in 1957. During the 1940s and early 1950s, several experiments were carried out to improve the Garand. One of the most common complaints was the limited-capacity 8-round en-bloc clip, and many experimental designs modified the weapon with a detachable box magazine. Springfield Armory's T20 rifle was a fully automatic version. Though not adopted, experience with a fully automatic Garand laid the groundwork for its replacement. Winchester Ammunition (a division of the Olin Corporation) saw the market for a civilian model of the T65 cartridge and released it commercially in 1952 as the .308 Winchester, two years prior to adoption of the cartridge by NATO. 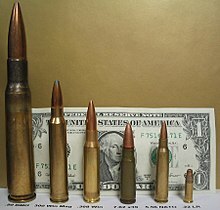 The dimensions of .308 Winchester are almost the same as 7.62mm NATO. The chamber of the former has a marginally shorter headspace and thinner case walls than the latter due to changed specifications between 1952 and 1954. This allows 7.62mm NATO ammunition to feed reliably in rifles chambered for .308 Winchester rifles but can cause .308 Winchester ammunition cases to rupture when fired in rifles chambered for 7.62mm NATO. The T44 was adopted as the M14 in 1957. Around the same time Britain and Canada adopted the Belgian FN FAL (L1A1 SLR British) as the L1 followed by West German army as the G1. The Germans soon transitioned to a modified version of the Spanish CETME rifle by Heckler & Koch that was adopted as the G3. With all three of these firearms, it was clear that the 7.62 mm NATO could not be fired controllably in fully automatic because of recoil. Both the M14 and FAL were later modified to limit fully automatic selection through semi-automatic versions or selector locks. Efforts were also made to improve control with bipods or heavier barrels. When the M14 arrived in Vietnam, it was found to have a few disadvantages. The rifle's overall length was not well suited for jungle warfare. Also, the weight of 7.62×51mm cartridges limited the total amount of ammunition that could be carried in comparison with the 7.62×39mm cartridge of the Type 56 and AK-47 rifles, with which the Vietcong and North Vietnamese Army soldiers were equipped. In addition, the originally issued wooden-stocked versions of the M14 were susceptible to warping from moisture in tropical environments, producing "wandering zeroes" and other accuracy problems, which caused the adoption of fiberglass stocks. In 1964, the U.S. Army started replacing their M14s with the M16, incurring another series of complaints from the British. Regardless of the M14 having disadvantages in jungle warfare, 7.62×51mm NATO rifles stayed in military service around the world due to several factors. The 7.62×51mm NATO has proved much more effective than 5.56×45mm at long ranges, and has since found popularity as a sniping round. For instance, M14 variants such as the Mk 14 Enhanced Battle Rifle and M25 Sniper Rifle were utilized in the United States military as designated marksman and sniper rifles. Shorter, easier-to-handle 7.62mm rifles like the Heckler & Koch G3 stayed in service due to their accuracy, range, cartridge effectiveness and reliability. Specialized loadings were created for 7.62×51mm NATO-chambered sniper rifles. They used heavier and more streamlined bullets that had a higher ballistic coefficient than standard ball rounds, meaning they shed velocity at longer ranges more gradually. Loss of velocity is important for accurate long-range shots because dropping from supersonic to transonic speeds disturbs the flight of the bullet and adversely affects accuracy. The standard M80 ball round weighs 147 gr and has a muzzle velocity 220 ft/s (67 m/s) faster than the M118LR 175 gr sniping round. 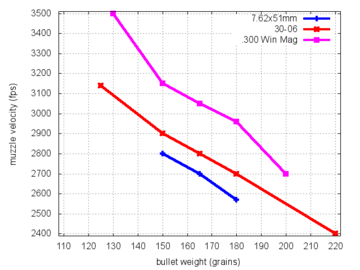 However, the M80 drops to subsonic velocity around 900 m (980 yd), while the initially slower M118LR is supersonic out to 1,000 m (1,100 yd) due to its low-drag bullet. The 7.62×51mm NATO round nevertheless met the designer's demands for fully automatic reliability with a full-power round. It remained the main machine gun round for almost all NATO forces well into the 1990s, even being used in adapted versions of older .30-06 Springfield machine guns such as the Browning M1919A4 from the WWII era. The .303 British Bren gun was also subject to conversion to fire the 7.62×51mm NATO round, the converted weapon being reclassified as the L4 Light machine gun. These have been replaced to a considerable extent in the light machine gun role by 5.56×45mm NATO weapons, such as the widespread use of the M249 SAW, but the 7.62×51mm NATO round is still the standard chambering for the minigun machine gin and most general-purpose machine guns such as the M60E4, FN MAG/M240, HK21, MG3, AA-52, Vektor SS-77, UKM-2000 and MG5 and flexible mountings such as helicopters, jeeps, and tanks. It is also commonly found in coaxial mount applications such as found in parallel with the main gun on tanks. The M80 7.62mm bullet type was also subject to 21st century ballistic studies. The U.S. Army has developed an improved version of the M80 ball 7.62mm round, called the M80A1. The M80A1 incorporates changes found in the M855A1 5.56 mm round. Like the M855A1, the M80A1 is expected to have better hard-target penetration, more consistent performance against soft targets, and significantly increased distances of these effects over the M80. The bullet is redesigned with a copper jacket and exposed hardened steel penetrator, eliminating 114.5 grains (7.4 g) of lead with production of each M80A1 projectile. The M80A1 began fielding in September 2014. The U.S. Special Operations Command plans to begin fielding of the 6.5 Creedmoor cartridge in early 2019 to replace the 7.62 NATO round in semi-automatic sniper rifles. Tests determined that compared to the 7.62 NATO, the 6.5 Creedmoor doubles hit probability at 1,000 meters, increases effective range by nearly half, reduces wind drift by a third and has less recoil. The same rifles can use the new cartridge, as their similar dimensions allow the same magazines to be used and the weapon only requires a barrel change. Cartridge, Caliber 7.62mm, NATO, Ball, M59 (United States): 150.5-grain (9.8 g) 7.62×51mm NATO ball cartridge. A further development of the initial T65 cartridge. It had a long heavy bullet with a Semi-Armor-Piercing iron or mild steel core and a gilded steel jacket. After the Vietnam War it was replaced by the M80 Ball cartridge as the standard round. Data contained in TM 9-1005-298-12 mentions the approximate maximum range of 3,820-metre (4,180 yd) at 856.2-metre-per-second (2,809 ft/s) muzzle velocity. Cartridge, Caliber 7.62mm, NATO, Armor Piercing, M61 (United States): 150.5-grain (9.8 g) 7.62×51mm NATO armor-piercing round, black cartridge tip. Data contained in TM 9-1005-298-12 mentions an approximate maximum range of 3,820-metre (4,180 yd) at 854.6-metre-per-second (2,804 ft/s) muzzle velocity. Cartridge, Caliber 7.62mm, NATO, Tracer, M62 (United States): 142-grain (9.2 g) tracer cartridge, orange cartridge tip. Data contained in TM 9-1005-298-12 mentions an approximate maximum range of 2,340-metre (2,560 yd) at 856.2-metre-per-second (2,809 ft/s) muzzle velocity. Cartridge, Caliber 7.62mm, NATO, Ball, M80 (United States): 147-grain (9.5 g) 7.62×51mm NATO ball cartridge. The U.S. Army's Ballistic Research Laboratory measured a ballistic coefficient (G7 BC) of 0.200 and form factor (G7 i) of 1.105 for the M80 ball projectile. Another source mentions a slightly higher ballistic coefficient (G7 BC) of 0.209. Data contained in TM 9-1005-298-12 mentions the approximate maximum range of 3,930-metre (4,300 yd) at 856.2-metre-per-second (2,809 ft/s) muzzle velocity. Cartridge, Caliber 7.62mm, NATO, Ball, Enhanced Projectile Round, M80A1 (United States): 130-grain (8.4 g) M80 Lead Free (LF) 7.62×51mm NATO ball cartridge. 114.5-grain (7.4 g) of lead eliminated per M80A1 projectile. Cartridge, Caliber 7.62mm, NATO, Ball, Overhead Fire, XM178 (United States): 7.62×51mm NATO Overhead Fire Application (OFA) cartridge using a solid turned Gilding Metal (GM) bullet. These were developed to supposedly make the OFA cartridges safer since there would be no small pieces of bullet that could separate and fall on the troops. Never adopted. Cartridge, Caliber 7.62mm, NATO, Tracer, Overhead Fire, XM179 (United States): 7.62×51mm NATO Overhead Fire Application (OFA) cartridge using a solid, turned GM bullet. These were developed to supposedly make the OFA cartridges safer since there would be no small pieces of bullet that could separate and fall on the troops. XM179/XM180 difference is the amount of trace mixture. Never adopted. Cartridge, Caliber 7.62mm, NATO, Tracer, Overhead Fire, XM180 (United States): 7.62×51mm NATO Overhead Fire Application (OFA) cartridge using a solid, turned GM bullet. These were developed to supposedly make the OFA cartridges safer since there would be no small pieces of bullet that could separate and fall on the troops. XM179/XM180 difference is the amount of trace mixture. Never adopted. 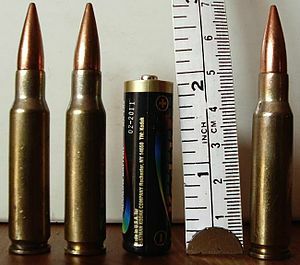 Cartridge, Caliber 7.62mm, NATO, Saboted Light Armor Penetrator, M948 (United States): 7.62×51mm NATO Saboted Light Armor Penetrator cartridge. Adopted in limited quantities only by U.S. Army. Cartridge, Caliber 7.62mm, NATO, Saboted Light Armor Penetrator Tracer, M959 (United States): 7.62×51mm NATO Saboted Light Armor Penetrator cartridge with tracer element. Adopted in limited quantities only by U.S. Army. Patrone AB22, 7.62mm × 51, DM41, Weichkern ("Soft-core"), (West Germany): 7.62×51mm NATO ball cartridge; Berdan primed, copper-washed steel jacket. German equivalent to U.S. 7.62×51mm M80 round. Standard service round for the G3 battle rifle. It has a 3,800-metre (4,156 yd) long dangerous space when fired between a 5° and 10° angle. Patrone AB22, 7.62mm × 51, DM111, Weichkern, (Germany): 147-grain (9.5 g) 7.62×51mm NATO ball cartridge, cupronickel-coated steel jacket. German equivalent to U.S. M80 round. In service with the German military. Known for severe fragmentation in human tissue due to its thin jacket, particularly around the cannelure. It has a 4,200-metre (4,593 yd) long dangerous space when fired between a 5° and 10° angle. Patrone, 7.62mm × 51, DM111A2, (Germany): Further low pollutant development of the DM111A1. Patrone , 7.62mm × 51, DM151, AP/Hartkern, (Germany):151-grain (9.8 g) 7.62×51mm NATO armor-piercing cartridge, tungsten carbide core, cupronickel-coated steel jacket. In service with the German military. It has a 4,300-metre (4,703 yd) long dangerous space when fired between a 5° and 10° angle. Patrone AM32, 7.62mm × 51, DM18A1B1, Übung ("Practice"), (Germany): 10-grain (0.6 g) 7.62×51mm NATO plastic training cartridge, plastic case cartridge colored light blue with an light 10-grain plastic bullet which is fired with a high initial velocity. non-corrosive, steel base with lead free primer. Developed from the Norwegian NM8 and NM127 short range practice rounds made by Bakelittfabrikken. Non-reloadable due to the plastic case. The IMI 7.62 × 51 mm Long Range Match was optimized for the M24 SWS in use by the Israel Defense Forces. The combined sniper weapon system achieves accuracy of 0.5 minute of arc. IMI,7.62mm × 51mm, Long Range Match 175 gr (Israel): 175-grain (11.3 g) 7.62×51mm NATO Match-grade round specifically designed for long-range sniping and optimized for the Israel Defense Forces sniper rifles, mainly the M24 SWS. It uses a 175-grain (11.3 g) Match King OTM-BT. An IDF M24 SWS with this round achieves accuracy of 0.5 MOA. Produced at IMI Systems "Izhak" Ammunition Plant in Israel. This four-character alphanumeric code is used by the US Armed Forces and NATO to identify the cartridge, the cartridge type, and the packing method (cartons, clips, link belt, or bulk) used. A111 (7.62mm Blank M82 Linked): 100-round M13 linked belt (M82 Blank) packed in a cardboard box. There are two boxes per M19A1 ammo can (200 rounds) and four M19A1 ammo cans per wire-bound crate (800 rounds). Used in M60 and M240 general purpose machineguns for training purposes. A159 (7.62mm Dummy M172 Linked) 100-round M13 linked belt (M172 Dummy) packed in a cardboard box. There are two boxes per M19A1 ammo can (200 rounds) and four M19A1 ammo cans per wire-bound crate (800 rounds). The munition is designed to simulate a linked belt of M80 Ball ammunition. Used for weapon manufacturing testing to conduct belt-pull tests for automatic weapons and for environmental conditioning tests of weapons, mounts and ammunition. The M172 linked belt is also used for developing new and/or improved mount systems for the vehicles that contain the M240-series machine gun. A165 (7.62mm Ball/Tracer Linked): 750-round M13 linked belt (4 × M80 Ball : 1 M62 Tracer). Used in 7.62 mm miniguns. AA11 (7.62mm Ball M118LR): 20-round carton (M118 Long Range Ball). There are 20 boxes per M2A1 ammo can (400 rounds) and two ammo cans per wire-bound crate (800 rounds). Used in precision match, designated marksman, and sniper rifles. AA11 (7.62mm Armour Piercing ): Used in sniper rifles. AB79 (7.62mm Ball M80A1 Linked): 100-round M13 linked belt (M80A1 Enhanced Ball) packed in a cardboard box in an M5 Bandoleer. There are two bandoleers (100 rounds each) per M19A1 ammo can (200 rounds total) and four M19A1 boxes per wire-bound crate (800 rounds). Used in M240 general purpose machineguns. AB86 (7.62mm Ball/Tracer Linked): 100-round M13 linked belt (4 × M80A1 Enhanced Ball : 1 M62A1 Enhanced Tracer) packed in a cardboard box in an M5 Bandoleer. There are two bandoleers (100 rounds each) per M19A1 ammo can (200 rounds total) and four M19A1 boxes per wire-bound crate (800 rounds). Used in M240 general purpose machineguns. ^ "M80 data". slickguns.com. Retrieved 29 May 2016. ^ SAAMI Velocity and Piezoelectric Transducer Pressure: Centerfire Rifle, 2013, p. 9, "VELOCITY AND PIEZOELECTRIC TRANSDUCER PRESSURE: CENTERFIRE RIFLE" (PDF). Archived from the original (PDF) on 2017-01-02. Retrieved 2016-11-10. ^ "FAQ: Difference between .308 & 7.62 X51 (NATO)". gunboards.com. Retrieved 29 May 2016. ^ "Sniper's Hide - Long Range Shooting, Precision Marksmanship, Gear Testing & Reviews - Scout". Scout.com. 27 May 2016. Archived from the original on 2 February 2013. Retrieved 29 May 2016. ^ "308 Win/7.62x51 compatibility". sksboards.com. Retrieved 29 May 2016. ^ "TECHNICAL DATA SHEET UNSAFE FIREARM-AMMUNITION COMBINATIONS" (PDF). Archived from the original (PDF) on 2013-11-16. Retrieved 2013-11-04. ^ "ATF Home Page - Bureau of Alcohol, Tobacco, Firearms and Explosives". www.ATF.gov. Retrieved 29 May 2016. ^ "How Much Does Your Ammo Weigh? - The Firearm Blog". 9 April 2016. 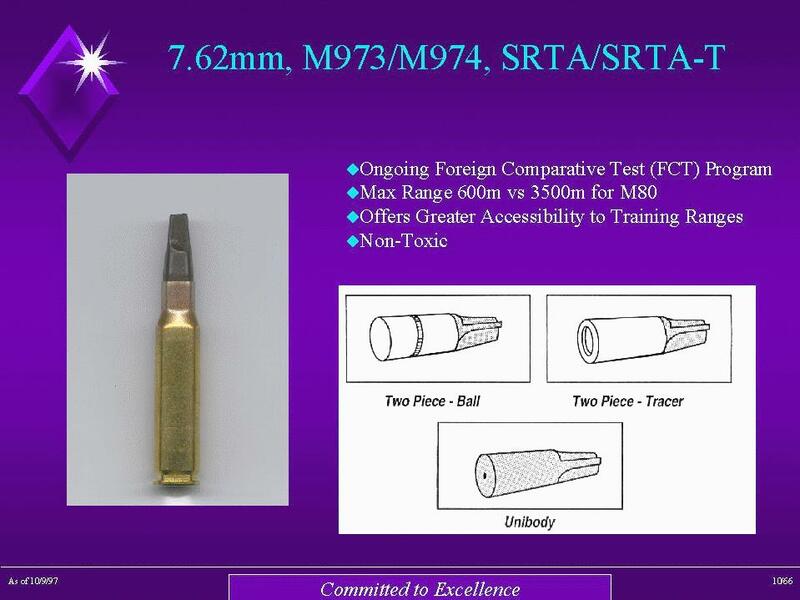 ^ "7.62mm (7.62 x 51 mm) Ammunition". www.inetres.com. ^ a b c Dockery, Kevin (2007). Future Weapons. New York, NY, USA: Berkley Publishing Group. ISBN 978-0-425-21215-8. ^ Anthony G. Williams. "Cartridges for Long-Range Sniping Rifles". quarryhs.co.uk. Retrieved 29 May 2016. ^ SOCOM snipers will ditch their bullets for this new round next year. Military Times. 8 May 2018. ^ Homeland Security shooters are dumping .308 for this long-range round. Military Times. 7 May 2018. ^ TM 9-1005-298-12, 7 August 1969, 7.62 Millimeter Ammunition Weights Dimensions, and Ballistic Data. ^ "The Case for a General-Purpose Rifle and Machine Gun Cartridge (GPC) by Anthony G Williams" (PDF). quarryhs.co.uk. ^ Anthony G. Williams. "The 6.5×40 Cartridge: Longer Reach for the M4 & M16". Small Arms Defense Journal. Retrieved 29 May 2016. ^ "Small Caliber Ammunition Enhancing Capabilities" (PDF). Archived from the original (PDF) on 2012-11-30. Retrieved 2012-11-08. ^ a b "History of the M118 Ammunition". Sniper Central. Retrieved 29 May 2016. ^ a b U.S. Navy Small Arms Ammunition Advancements - 7.62MM Special Ball, Long Range, NAVSEA Warfare Centers Crane Archived 2010-10-11 at the Wayback Machine. ^ Martin L. Fackler (1989). "Wounding patterns of military rifle bullets". International Defense Review (1/1989): 59–64. ^ "7,62 mm x 51 Ball DM111 A2 Soft core data sheet" (PDF). Archived from the original (PDF) on 2017-11-10. Retrieved 2017-11-10. ^ IMI Systems Small caliber ammunition and product brochure, IMI Systems website. Accessed: 2017-11-13. ^ An article about IDF snipers, Walla!News. See last image (in Hebrew), it reads "groups of 12 cm in a range of 800 meters". ^ Marines (14 October 2015). "How to Shoot Like a Marine - Sniper Edition" – via YouTube.